One egg to the side of the rest. is that number 5??? Now she's pushed it under her. Visual confirmation of 5 eggs!!!! A few minutes ago the female kestrel stepped aside the 5(!) eggs, ate the rodent that the male delivered about three hours ago, and then went back to incubating the eggs. On an otherwise quiet morning in the 'maternity ward', it looks like Mama Kestrel seems to have a deep down itch just below the wing surface and her head goes back and forth deep down. This could even be in her sleep, and has been going on for at least a few minutes and it's just before 9:00 Boise time. Our handsome little male sits calmly atop those little treasures. It snowed here in Minnesota a few days ago and I wondered about birds here coping with the regression to the cold, but if they are anything like our lovely resilient little family they will pick up where they left off. I always love peeking in. Thanks again for all you do. SNOW again. come on Boise it's spring!!! I can't believe it's snowing again. I thought the forecast would be lying. What is this spring!? Hahaha. Yes, but that little female is pretty snugly settled on the eggs. Hope it isn't too cold there? Because cold plus snow isn't great. It looks windy. crud, it's coming the box again. Stupid snow. Mama Kestrel looking like her pretty little self. Weather looks great. Hatch day around May 7, right? May 8th....my birthday!!! What a cool present that would be! Dad Kestrel asleep on top of the eggs, breathing hard, around 9:30 Boise time. Just saw the male kestrel jump off the eggs, flap his wings a moment and put his head in the corner, then get back on the eggs again. This stint I see the male looking up at the camera a lot. Since it is a very windy day I wonder if some motor makes noise when the camera focus has to readjust. Very observant bird today. No body in the chat today and I had a good question. Maybe Thursday! I wonder if it's them seeing the movement of their reflection, perhaps. They're highly visual animals, so I wouldn't be surprised if seeing something move on the cam surface catches their attention for a moment. Delora, is the camera in a different spot this year in order to avoid a soiled lens? The reflection could be more distracting this year than last or in past years. The camera is in the same place as last year, however we did cover some of the outside of it with a cone of plastic to prevent soiling. Perhaps the cone is interesting to look at, or makes for an odd shadow? Hard to say. Hopefully I won't have to bother them as much this year to clean the lens, however! LOL you were up there every day for a while! Little squirters. Yes, it's two Kestrel Kids. Yes, it's two Kestrel Kids. One just very recently hatched. I am crying for joy. There are 6 eggs? When did that happen? Are there 6 eggs or is that just part of a hatched egg? Babies!!!! My class will be so excited!!! Me too!! OK it turned over, it's just a shell. Dang I thought I missed something there. Yup! Just shells scattered about after hatching! 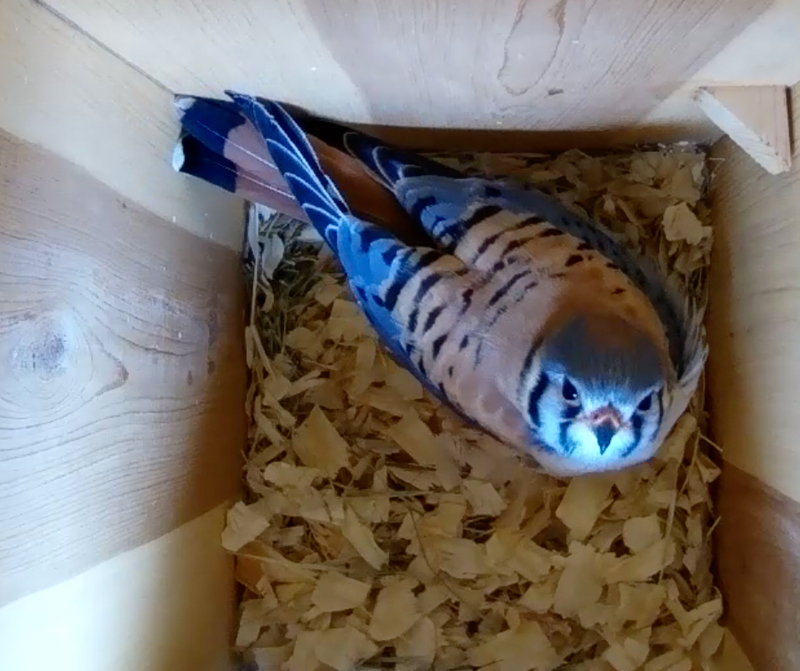 Dad Kestrel keeps looking into the box. It's like the parents are so excited they hardly stay still. Mama Kestrel needs to solve a problem about 8:21 Boise time. Her two hatchlings are widely separated: how to keep them both warm now?